There are a lot of arguments for keeping your horses at your own home instead of boarding them, but one that seems up come up regularly is that it’s less expensive to keep them at your own home. I think this can be true, but it’s dependent on where you live, how you choose to keep your horses, and how many horses you have. In this post, I’ll discuss how my costs have changed and compare boarding rates to my expenses. First of all, let’s lay out what my current horse and living situations are: I own three horses who live with me on a 7-acre property just north of Tulsa, Oklahoma. 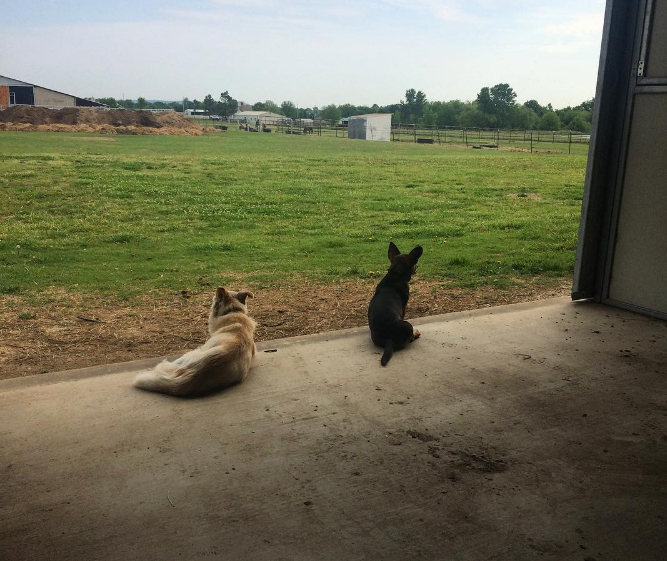 The property includes a large pasture, small paddock, 4-stall Barnmaster barn with a bathroom, tack room, and wash stall with hot and cold water, trailer storage shed, hay barn, shop building, and house. 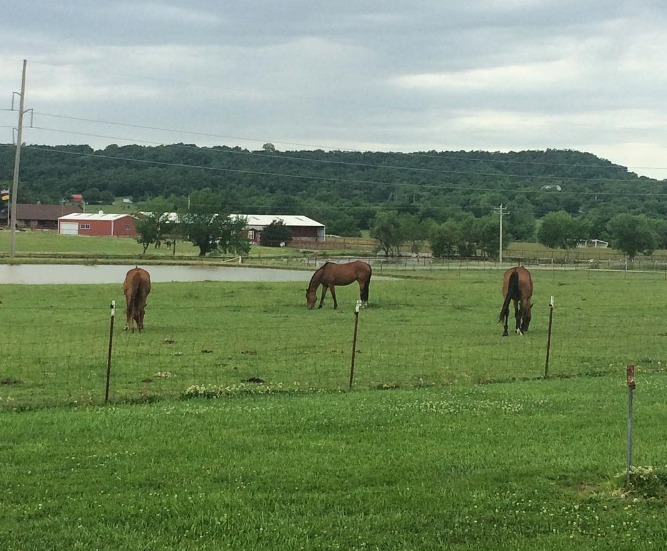 My horses eat concentrates, supplements, and forage in addition to the grazing they have on the pasture. They are turned out in the large pasture for approximately 10 hours during the day and spend the evenings in the barn and attached sacrifice paddock. I am responsible for their care; I do not employ anyone to assist in their care. I track horse-related expenses in a spreadsheet that’s very basic. I broadly categorize my expenditures into six groups: barn, competition, feed, health, tack/apparel, and training. Those groups are broken down into several subcategories. For example, “Competition” includes subcategories for membership dues, entry fees, and lodging. I document each expense, the amount, and put some basic notes on what the expenditure was for. 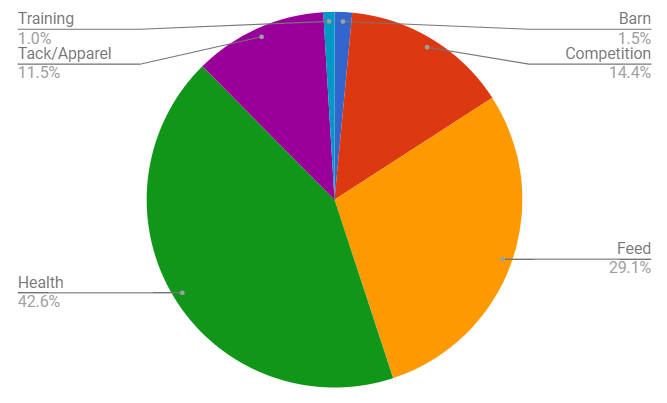 This pie chart shows what percentage of my 2017 expenses each category accounts for. There are some caveats to this chart: “Health” is somewhat misleading, as over half of the money I’ve spent in that category is directly related to breeding Gina. “Feed” does not include a bulk hay purchase made last fall. Let’s break down the “Feed” category, since equine healthcare is something I’d be spending money on even if the horses were boarded. (The same is true for the most of the other categories, too.) What’s my monthly feed cost per horse? From January 1 to today, I have spent a total of $1,669.75 on feed, supplements, and treats. My hay cost is more complicated to calculate, as the horses split a bale of hay between them in the winter, but only split half a bale a day in the summer (because the pasture provides adequate forage). I did not track the date I reduced their hay ration, but I would estimate it was probably around mid-April. That means I’ve spent about $767.25 providing hay for the horses this year. That’s about $420.19 per month in total feed costs (hay + grain), or $140.06 per horse. The barn is fairly new and is in great shape! As you can imagine, feed is not the only thing affecting the horses’ living situation. Fortunately, the barn and fencing did not require repair before we moved in, and my purchases for the barn have been minimal. (I bought a small shelf for the tack room, a set of cross ties for the aisle, and a few buckets.) I don’t keep shavings in the stalls unless I know the horses will be staying the night in there (which happens infrequently and only in severe weather). The barn doors are kept open so the horses can freely move between the paddock and the barn area- most of the time they choose to roam around the small paddock. The move to a larger property also brought some expenses that aren’t directly horse-related, but wouldn’t be occurring if we hadn’t moved. Our mortgage payment is slightly higher than it was at our previous home, and I contribute a larger percentage of my income to that payment than I used to. We had to buy a lawnmower (because there’s no way we’re push-mowing an acre’s worth of yard). The house is larger, so our electric and propane bills are higher. I might as well invest in Monsanto stock what with all the Roundup I’m buying in a vain effort to control the weeds in the driveway, the gravel parking areas around the barns, and the lawn. It can sometimes be difficult to neatly delineate household and horse expenses when your household is so closely tied with the horses. For simplicity’s sake, we’ll ignore the Roundup and lawnmower, and only include my increased contribution to the mortgage and utility expenses; that’s $300 per month, or $100 per horse. This means the cost per month of keeping my three horses at home is $720.19, or $240.06 per horse. One thing I haven’t addressed is the cost of my time. There’s a couple of reasons for this; the first is that I don’t actually spend that much time doing chores day-to-day. I spend about half an hour in the morning feeding the horses, waiting for them to eat, and turning them out front. My neighbor has her barn help take them back to my barn in the evening before I get home from work, and I spend about half an hour in the evening feeding them dinner, sweeping the barn, and cleaning their water tank if it’s dirty. Projects like spraying weeds, organizing the tack room, and leveling the stall floors are either worked in around other things I’m doing outside or have a weekend day dedicated to them. For example, if I’m waiting for a friend to arrive at the barn so we can ride together, I’ll grab the sprayer and try to kill some weeds. The other reason I don’t factor the cost of my time into the cost of keeping the horses at home is because I enjoy the work it requires. It doesn’t usually feel like work. Looking over toward my neighbor. Moving to a property where the horses live with me has also affected other areas of my life. My work commute quadrupled; previously, I lived two miles from the tack store where I work. Now, it’s a 45-minute drive to the office. I was able to negotiate working from home two days a week. That means my fuel costs haven’t really changed- I’ve just switched from going to the barn three days a week to going to the office three days a week- but I spend more time with the horses and more time riding. Johnny’s commute decreased in cost, as he doesn’t need to take a toll road to get to his workplace any more (and his mileage is about the same). Sunrise as viewed from the back door of the house. In general, I haven’t found there’s much of a financial difference between keeping the horses at home and boarding them. The differences are intangible in nature: how do you quantify happiness and satisfaction? I’m over here in fantasyland at the idea of what all else I could do with my money if board was only $300. I envy you that! Even our pasture board is more like $400+. I would love to have my horses at home though, so I could see them all the time and do everything my way. I feel like my neighbor’s place is a total steal! Her normal rate for full care board is $400/month (which includes hay, feed, turnout, blanketing, fly spray, arena usage, vet/farrier coordination, and trailer parking), but she cut me a deal because I was willing to let Moe and Gina be used as lesson horses. It IS nice to be able to see the horses all the time! I keep saying that I’m going to do a post like this but I’m too lazy to put it together. My record keeping of horse expenses is pitiful, so it makes it harder. haha. I do have a paying boarder that helps equal things out though. Well…kind of? I was doing so well at tracking expenses, and then life got sort of hectic, and I spent half an hour the other day entering in purchases from a month ago, haha! It’s hard to keep up with sometimes! Such an interesting question that I think many people who keep horses at home should ask themselves (probably more seriously than they do). I know several people who have either experimented with or dived head first into keeping their horses at home, and as someone who does not do that (but occasionally house sits for barns/small farmettes), I see big differences between boarding and keeping at home. And I think some people skim over them in order to justify keeping their horses at home. For example, the drive time between one farmette that I often stay at and my workplace, or even the owner’s workplace, means that it’s inconvenient to head back and forth to the house. It’s not an “efficient” set up for (my) life, especially when animals need to be checked during the day (hot days, medication, etc.). Inefficiency drives me insane! And inefficient is the only way to describe filling the waters of ten horses with a hose. BUT, just because it’s not my choice doesn’t mean it doesn’t work for other people. It’s just very clear to me where the balance lies in my life! Yes! I think you’re absolutely correct; many people don’t really look at what keeping a horse at home will cost them in non-horse areas of their lives. I think people often assume they’ll save time and money because they’re not driving to the barn or paying another person to care for their horse. But buying horse property usually means moving out of a town or city. Where will you grocery shop? How long will it take you to get there? If you enjoy traveling or travel often for work, do you have a trusted individual to farm-sit for you? Are you willing to pay that person a fair rate? When I’m in the office, it is extremely inconvenient for me to drive home and back. I know I have a couple of options if I needed to do something like apply medication for a week or so. My job is very flexible, so I could either work from home or go into the office late. I can also rely on my neighbor to help me with something like that (though I try not to ask her for too many favors). My particular situation works for me, but working so far from where your horses live might not work for everyone. One way to have horses isn’t better than the other; they’re just different! You definitely have to find what works best for your own life! Thank you for writing this post! Certainly the specifics can vary a lot due to individual circumstances but it’s useful for me to see how your calculations added up, namely that the big comparison is increase in mortgage/utilities plus hay vs. board. I like to tell myself that I could justify the extra cost for an acreage because I would save on board, but I need to run more numbers to see if that’s actually true. I am convinced that the numbers would be more favorable if I decided to get a second horse, and that theory does seem to hold weight in your example. The increased mortgage and utilities cost is a thing for sure, but I don’t necessarily think it has to be. The house on this property is nearly twice the size of our previous house and has more windows and higher ceilings. We don’t NEED the extra square footage, windows, or ceiling height (although I enjoy those things!). We likely would have purchased a property that was less expensive with a smaller house and more acreage (and used the extra budget money to build an arena and/or make improvements to an existing barn) had this place not been right next door to the boarding barn. I guess what I’m saying is that it would have been possible for us to find something that was closer to our previous home’s mortgage and utility costs if we hadn’t decided it was worth the extra money to not live next door to an existing arena (and friend). It sounds like being next door to the arena has worked out great for you though! I know that buying an acreage in my area is not possible for the cost of my current mortgage unfortunately. Congrats on being Candy’s owner! Certainly there are many non-financial pluses and minuses that come into play! Developing land for equine use is a significant investment! I haven’t looked into exactly how much that would cost, although I think it might be something we look into in the future. Fencing, barns, land clearing, arenas- they all cost money. I like to think the non-financial pluses outweigh the minuses, but ask me again when I’m slogging through another day of cleaning stalls in 40 mile-an-hour winds and below-freezing temperatures this winter, haha! This would make a great blog hop! I think that the expenses are less then boarding but I am like you about the intangibles. I don’t think I would care if it actually is cheaper to board. I would love to read more bloggers’ comparisons! I’m sure property and feed costs are much different in other areas, but do board costs go up proportionally or are they inflated? Are other bloggers seeing a huge savings keeping their horses at home? Inquiring minds want to know! Being drama-free is fantastic; my old barn didn’t really have any drama, but it’s nice to know it’s not going to happen at my own place. Of course, the benefit is my mare has a home for the rest of her life and I didn’t have to sell her for college like so many of my friends did. I can always go home and hop on, I didn’t have to drive to the barn after school, etc. As a teenager my most hated part? Riding alone. Having my arena at home meant I rode alone unless I had a lesson and I really missed having barn friends and the social aspect. I think arena upkeep is a huge expense, and it’s one I’m very glad I don’t have. Footing costs (even if you’re just buying sand to add to existing dirt), equipment purchases, drainage solutions- arenas are expensive in time and money. Riding alone never bothered me as a kid, but I know I’d be lonely as an adult! It’s so much more fun to ride with friends. As you said, it’s hard to differentiate things between horses and home. I had to buy a big mower for my home…and my business. I had to buy a tractor for my home…and my business. My horses are total cheap dates, so I know that if I were to ever board someplace it would drive me bonkers to pay more. However, your amount per horse at home is right around what most of my partial boarders pay. Partial is $200, then they pay me for the hay they used. But, in my opinion, they have a huge benefit of having someone feed for them everyday at the same time, and having access to two arenas and a round pen. That’s a pretty good deal! Not to mention, the barn owner (moi) checks on horses constantly, including a night check every evening. That’s worth a lot. I can’t imagine how difficult it is to separate horses, home, and business! $200 is a fantastic deal for partial board; not having to worry about sourcing hay yourself, having access to arenas, and having someone feed and check on them is well worth that amount! I’ve had my horses home for just over a year ago and although I did not factor time or utilities (couldn’t differentiate the difference between house water/electric and the barn, and the first 3 months I had them home our water bill actually dropped, go figure!) I’ve actually saved THOUSANDS in just one year (2 horses, board was $535/mo each). Cost per month at home varies based on whether they are eating more pasture or hay and how much my husband and I travel that month and have to pay someone to feed/etc, but it ranges from $275-$500/mo combined. Spread out over the first year, it was over a $7600 savings (!!!) I track hay, grain, bedding, and barn sitting. Costs like wormer, farrier, supplements, etc are not factored in because those costs remained the same whether I was boarding or had them at home. I also work from home, so not driving to the barn (although only a 15 minute drive) is a savings in time/gas that I’m sure off-sets some of the other things I’m not counting. We did build the barn and put up all of the fencing, so I do take my yearly savings to calculate how long it will actually take to cover the cost of everything we had to build and pay for upfront. All in all though, the savings for me was a huge driving factor, allowing me to have both a retired and competition horse and pack my show schedule to where I could easily show 12+ times a year. Like you, the twice a day doesn’t feedings don’t feel like work, plus I really enjoy the peace of mind of having them home. Not driving to the barn IS a savings in time/gas! When I was unemployed and the horses were boarded in Tulsa, I could only go down to see them 3 days a week because that was all the gas budget really allowed for at the time. 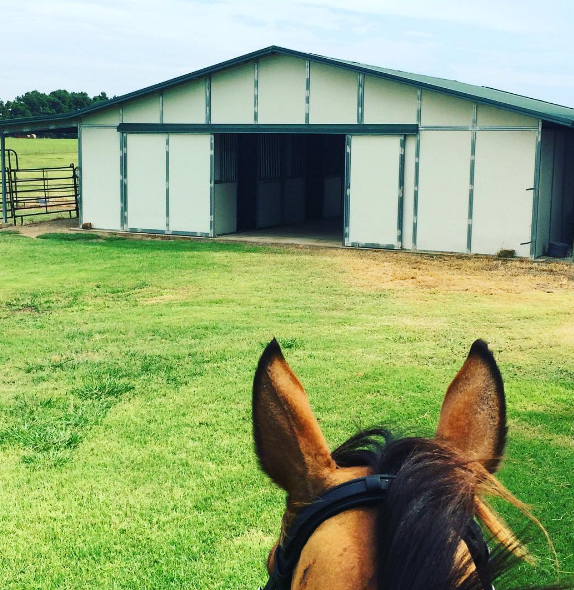 For us, it was worth it to pay more for this property that already included a barn and fencing (and was next door to arenas) than build them ourselves. I don’t have a great track record for working with contractors, and the expense of building those things was intimidating! You’re smart to factor the cost of building into your yearly savings! LOVE seeing these numbers as they’re very comparable to what I anticipate mine would be if/when I get my own land (my biggest dream). Great post and thanks for sharing! You’re welcome! I realize these expenses vary based on a variety of factors, but I’m glad it’s helpful to see them! I do not track my expenses nearly as well as I should to put together a useful comparison, but I absolutely know there is no way I could afford to keep 4 horses if they were all boarded. And at one point, we had 8 here! My mortgage on our acreage is less than what I was paying to board 2 horses before we bought the land. But you’re right about the trade-offs — the only person we really trust to watch our place is my mom, so getting time away can be very tricky! But it’s worth it to us. Yeah, if I’d been paying the median board price in my area, I wouldn’t be able to afford all these horses! I also probably wouldn’t have all these kittens either, haha! I think a big factor for this is where you live too. For me right now in my area it would be almost impossible for us to afford land with a house and barn already established or even to buy land with a house and build a barn for under 1hr commute for both of us. That combined with the fact that my husband would rather not maintain property had me quickly finding a house as close to the barn as I could. Cost wise for me after running the numbers we would save money but nothing crazy and not enough to offset the time / money that went into it for either established horse property or building. Thanks for sharing those #s! 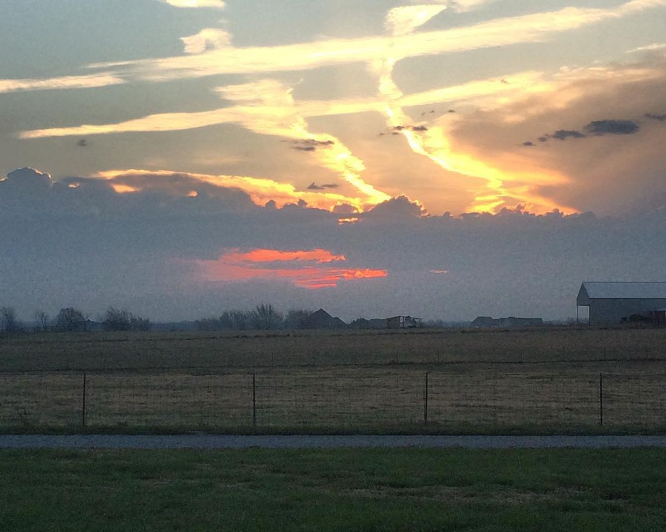 Land is certainly plentiful and cheap here in Oklahoma; the only downside (other than, you know, living in Oklahoma) is that the land quality is so poor that you need lots of acreage to support horses unless you’re willing to feed hay year-round. This property was within our budget and has lots of pros, but it’s certainly got its fair share of cons, too. I think Johnny had nightmares about property maintenance (despite my reassurances that it wouldn’t be THAT bad), but he’s totally embraced the semi-rural lifestyle! He enjoys helping me feed in the evenings and doesn’t seem to mind spending an hour mowing once a week. Our situation works well for us, and I totally get that someone else’s mileage may vary! One of the things that consistently comes up when we talk about moving out of Oklahoma is what we should do about the horses; depending on what’s affordable and what commutes look like, it may be a better idea to board, depending on future circumstances. We’re stuck here for now, tho, so we do what works! EVERYTHING is so much cheaper where you are! I don’t think I could even find pasture board around here for under $600. No where does full board under $1000. I find this all so interesting!! Thanks for sharing!